I would like to extend my sincere gratitude to Michael Witzel, Wales Professor of Sanskrit at Harvard University and esteemed editor of the Harvard Oriental Series, for kindly approving the Indian publication of The Yoga sastra of Hemacandra, a Twelfth Century Handbook on Svetambara jainism. This Indian edition is a revised and expanded version of the original, published as Volume 60 of the Harvard Oriental Series (ISBN 0-674-00934-7). I also want to express my heartfelt gratitude to Professor Martin Gansten for his excellent proof reading of the manuscript and for suggesting valuable improvements of the translation. Warmest thanks also to Manish Modi of the Hindi Granth Karyalay for including it in the Pandit Nathuram Premi Research Series. When the author of the Yoga sastra completed his scholastic summa of Svetambara Jainism and presented it to king Kumarapala, not only was his name inscribed in the royal chronicles of the Caulukya dynasty, he also became a famous and respected scholar for those future generations, Jainas and non-Jainas, who came to regard his exposition as the arguably most systematic and clear work of its kind. Born in a town located sixty miles southwest of Ahmedabad during the latter part of the 11th century, Hernacandra! grew up in a region where the spread and development of religious ideas were not impeded by Islam, even though the region was still marked by the political destabilization which had resulted from Mahmud Ghazni's invasions at the beginning of the century Under the reign of the Saivite king Kama and his wife Mayanalladevi, Hemacandra and his fellow Jainas lived in relatively peaceful coexistence with various Saiva denominations, all profiting from royal patronage in compliance with ancient Indian royal ideology. At the age of eight Hemacandra left his parental home in Dhandhuka for Stambhatirtha (modern Cambay) unaware that this journey would mark the starting-point of a career as an outstanding monk-scholar, which would earn him the honorific title Kalikalasarvajna, "The Omniscient of the Degenerate Age", among his co-religionists, as well as a place of honour in general Sanskrit literature. At Stambhatirtha, the young Cangadeva- was initiated into a mendicant order by his teacher Devacandra. Under the name of Somacandra he was now a Jaina monk of the Vajrasakha of the Kotikagaccha, the famous Svetambara order known afterwards as the Tapagaccha. Judging from his future literary production, Somacandra, during the following years, received an education the basic elements of which he shared with most of his Indian and, for that matter, European colleagues. Like the convent schools of medieval Europe and the various North Indian Buddhist and Brahmanical seats of learning, the basic elements of his jaina education consisted of grammar, dialectics and rhetoric. In addition, and as a further supplement to the purely confessional training, various arts and sciences of jaina as well as Buddhist and Brahmanical provenance were studied." Nonetheless, the sole object of the education, mediated through a learned lingua franca, was ideally not to produce a man of extensive reading, however eloquent and deliberate, but a wise man, a "Sanskritist", whose insights were morally grounded,emanating from rational argumentation, personal experience and humble respect for the teacher and his teaching. Once Somacandra had completed his basic education, which he obviously did with the highest aspirations since he even addressed Brahmi, the patroness of learning, for her grace,' his teacher appointed him as his successor. At the age of 19 and under the clerical name of Hemacandra Suri he was now authorized to provide his own exegesis of the Svetambara canonical scriptures. The greater part of his life was spent at Anahillapataka, at that time the capital of Gujarat. Here he became the court scholar and court annalist of the Caulukya king, Siddharaja jayasimha (1093- 1142), under whose reign the Digambaras were defeated by the Svetambaras and in honour of whom he prepared his first major work, the Siddha[raja- ]hema[candra], which still is in use among Svetambara mendicants. The king, who shared the same persuasion as Caciga, Hemacandra's father, died without a son and was succeeded by his grand-nephew, Kumarapala (1142-1173).3 The accession was, however, not unproblematic. Jayasimha several times tried to kill the future king, and if we are to believe the jaina biographers, it was due to the efforts of Hemacandra that he eventually ascended the throne, an event which in his Trisastisalakapurusacaritra a jaina teacher portrays Mahavlra as having prophesied. The motive behind Kumarapala's conversion and the extent to which he actually adopted the faith of the man who is claimed to have saved his life, and who was instrumental in his accession, are difficult to establish." Apart from personal reasons, Kumarapala may, like so many others of his royal colleagues, have sought alliance with a religious group that favoured his own warrior-king caste (Ksatriya), the prerequisite of being a king, and thus contended the Brahmanical claim of ascendancy. He may also have had an economic motive behind his alliance with the jainas, who due to their standing in industry, commerce and banking in Gujarat were capable of improving the finances of the State which supposedly had suffered from costly wars.' In any case, as a result of Kumarapala's conversion, Hemacandra kept his royal appointment and the Jaina congregation received financial support as well as access to the court. This enabled Jaina ministers and financiers to come even closer to the political power," though not without opposition from the Brahmanical establishment.' Irrespective of whether Kumarapala was totally committed to Jainism or, as some of his activities suggest, he remained true to' the faith of his predecessors in matters related to the State while viewing Hemacandra as his personal guru, all available accounts, jaina and Brahmana, certify that he took the minor vows of a jaina layman and consequently sought to turn Gujarat into a model jaina state. He erected temples and urged its citizens to abstain from meat, liquor, hunting and gambling and instead to give priority to literary" and scientific pursuits. Following Kumarapala's conversion, and at his request, Hemacandra wrote the Vftaragastotra, Trisastisalakapurusacaritra. Yoga Sastra and Svopajnavrtti. Kumarapala died heirless and was succeeded by his nephew, Ajayapala, a Saiva who during his short reign (1175-1178) presumably was responsible for severe persecution of the jainas, including the execution of a jaina minister as well as of Hemacandra's successor, Ramacandra. The situation improved later with two jaina ministers serving under Ajayapala's successor, but no royal patronage was ever received from the State. Instead, merchant princes, such as Vastupala and Tejahpala, came to the rescue and through their financial support temples such as Girnar and Abu were built. In 1172, Hemacandra died by fasting to death and soon after, a new wave of Muslim invasions erupted. Under Muhammad of Ghori, supremacy was established over most of northern India, including Anahillapataka. It was not until the fourteenth century, however, that Muslim rulers entered Gujarat, some of whom the Tapa and Kharatara Gacchas tried to influence. From then on jainism was not connected to the State authority and no proselytizing took place. Furthermore, the Sanskritization and spreading of Sanskrit culture in Svetambara Jaina circles gradually diminished, as this to a great extent had been the work of Hemacandra. The Yogasastra with its voluminous auto-commentary, the Svopajnavrtti, is the most comprehensive treatise on Svetambara jainism known to us. Its influence extended far beyond confessional and geographical borders,especially the four first chapters.' 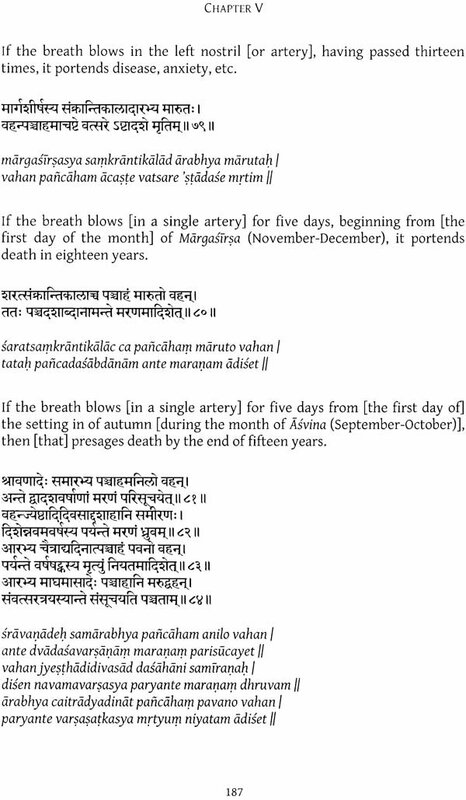 The 13th century Digambara author, Asadhara, incorporated, for example, whole passages from these chapters of the Yogasastra into his Sagaradharmamrta,2 and the description of jainism in the standard doxographical work, the Sarvadarsana- samgraha of Madhava, is partly based on the same chapters of Hemacandra's magnum opus. They also came to serve, and still do, as a handbook for the Murtipujak community in Gujarat and among Svetambara jainas in East Africa, Great Britain and North America." Such an achievement would, however, not have been possible if it were not for the jaina community and its persistent endeavour to preserve the cultural and religious heritage of jainism in memory and writing." Nevertheless, it still required a man of eminent erudition to be able both to systematically document the jaina doctrine and to present it in an attractive and accessible way both to the jaina congregation and to the non-Jaina religious communities - especially those of Saiva provenance - without endangering or misrepresenting it. In using old and well proven methods of survival and growth, such as seeking government patronage and adapting to the prevailing religious environment by appropriating non-jaina terminology, metaphorical language, compositional principles as well as making use of verbal ambiguity, points of common dogmas, and tenets professed by the opponents' authorities, Hemacandra was able to defend and propagate Svetambara jainism. Hemacandra, like many of his predecessors, must also have been carried by the conviction that if he did not firmly establish what he reckoned as jaina orthodoxy and orthopraxy, the unity of the dogma was endangered and thus liable to being overshadowed by Saivism and Islam. Even if there was no immediate threat, either from within Svctambara jainism or from outside, Hemacandra's intention behind such a comprehensive project as the Yogasastra and the Svopajnavrtti must have been to propagate a coherent jaina creed among the Jainas themselves as well as among ordinary people, intellectuals and State officials. He was thereby also able to check certain extreme tendencies within jaina ritualism, such as worshipping and propitiating the already dead and granting the worship of yaksas almost the same status as that of the Jinas themselves.' Inner disintegration was certainly not conducive to Jainism becoming a State religion or receiving support and respect from the surrounding religious communities, a prerequisite for a secure if not flourishing future. Before I commit myself to a paraphrase of the YogaSastra as it unfolds itself, I shall attempt to bring out its fundamental doctrines and basic structure in order to lend meaning and function to the specific ideas in their individual ramifications as well as to tie them together into a systematic whole. 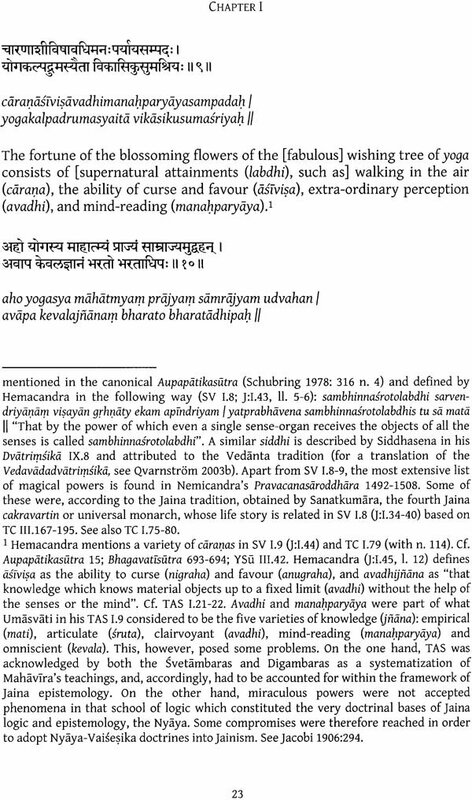 Hemacandra's account of jainism consists of a systematic presentation of a set of ideas and practices originally belonging to the Svctambara canonical scriptures (sruta) and tradition (sampradaya), but moulded by Hemacandra into a coherent whole with the help of the intellectual efforts of a long row of scholastic thinkers, including Umasvati and Haribhadrasuri. 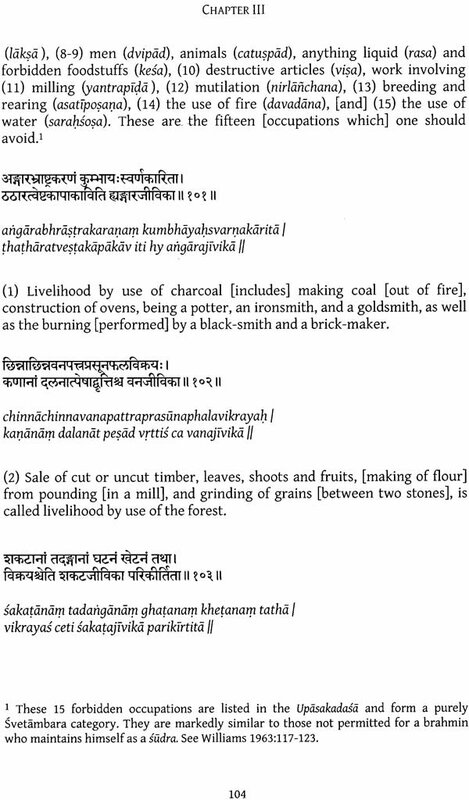 In addition, the author of the Yogasastra integrates innovations of his own as well as non-jaina elements of pan-Indian and Saiva provenance, attesting to a strong Tantric influence on medieval jainism.i Some of these elements came to be perpetually included within Svctambara orthopraxy and orthodoxy due to the normative status that came to be acquired by the YogaSastra. Like many of his predecessors, Hemacandra uses the tripartite structure of the three jewels (ratnatraya) - correct belief (darsana), knowledge (Jnana) and conduct (caritra) - as an organizing principle in the Yogasastra. 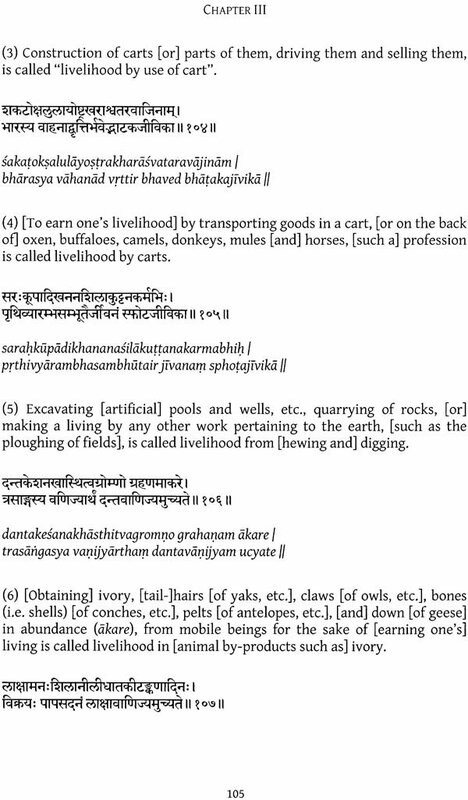 Although the terminology is borrowed from early Buddhism, this threefold structure seems to be unique to Jainism and occurs already in the canonical Sutrakrtangasutra and Uttaradhyayanasutra. It was, however, first systematically utilized by the author of the post-canonical Tattvarthasutra in his attempt to epitomize the canonical teachings." Underlying this tripartite structure is the doctrine of a twofold dharma or teaching (dvidharma) which at its centre has the idea of a perfect human being - a homo divinus or "real God" - whose belief, knowledge and conduct serve as the prime authority and role model. The Jaina perfected human being offers a norm or teaching (dharma) which has neither been created by himself, nor by another human being or by a God, but is eternally present within every being as his or her own Self VIva) and is thus available to all. The teaching has two main aspects, moral (karman) and cognitive (jnana). The moral aspect is concerned with activity (pravrtti) in the form of proper conduct, the cognitive aspect with non-activity (nivrtti) in the form of a correct understanding of reality: intellectual and experiential. The former aspect is thus devoted to improving activity, the latter to diminishing and finally suppressing activity. The former includes instructions about how mental, verbal and physical activity should be performed, the latter how these activities should be concluded. The fundamental components of Jainism as depicted by Hemacandra under the labels of the three jewels (ratnatraya) or the two aspects of dharma consist, accordingly, of karmayoga and jnanayoga accompanied by bhaktiyoga4 in the form of a general acceptance or confidence in the latter two and its discoverer or communicator: the Jina or the Tirthankara. These aspects were supplementary to each other and applied to mendicants and lay persons, differing in emphasis, mode of expression and purpose. Cultivation of mainly the moral aspect, as in the life of the lay person, leads at best to temporal happiness (sukha) and rebirth in heaven (svarga), whereas refinement of the cognitive aspect in the form of advanced intellectual and meditative practices, as in the case of the mendicant, results in eternal bliss, supernatural powers (siddhi) and liberation from cyclic existence (moksa). Except for certain qualities which are restricted to those few chosen who are to become a Tirthankara or jina. such as the ability to teach, every human is therefore capable of reaching the same level of perfection as the Jina and thus verify through his or her own reason and experience what has been taught - orally or in written form - by the jina and his innumerable predecessors and successors. Apart from the three jewels (ratnatraya) and the doctrine of a double dharma (dvidharma), Hemacandra applies yet another organizing principle in the Yogasastra: the eight limbs of yoga. This well-known device, classically formulated by Patanjali in his Yogasutra, forms, as it were, a window dressing on top of the three jewels and its foundation, the double dharma. Viewed as a rhetorical stratagem, as in the case of the Yogadrsti samuccaya by the other great exalter (prabhavaka) of Svetambara jainism, Haribhadrasuri;' it serves the purpose of adapting jainism to the prevailing religious environment as well as to the larger pan-Indian intellectual debate. Thereby it was instrumental in converting non-jainas, including the Saivites of Gujarat, to jainism. The fundamental principle of a double dharma and from this derived doctrines of three jewels and an eightfold path, shows structural and doctrinal similarities with various Brahmanical traditions and their doctrines of a twofold dharma related to the two parts (kanda) of the Vedic corpus, the karmakanda and the jnanakanda. Irrespective of its historical origins, this idea was conceptually captured and defined in opposition to the Vedic tradition and its insistence on an authorless scriptural authority, and was used by Hemacandra in his critique of Vedic ritualism and Brahmanical theism. whether these similarities stem from a srama1Ja influence on the Vedic tradition or are the result of parallel developments.' karman was understood by the jaina, Buddhist and Brahrnanical traditions as predominantly moral- and required jna.na for its proper implementation. Ritual activity was, however, not completely abandoned, only the violent and thereby immoral ritual practices were condemned as well as those which instead of being oriented towards mundane benefits promised liberation. The other main aspect of the Jaina teaching, the jewel of correct knowledge (samyagjnana) or the cognitive aspect of the double dharma, is the prime concern of the fourth chapter of the YogaSastra. Contrary to the description of the three jewels (ratnatraya) offered in chapters one to three, the fourth chapter views dharma, in the form of the three jewels, not as distinct from the human being who enjoys this teaching (dharmin) and who pursues its moral and knowledge, but instead as identical with the human being and his Self (Jiva): the agent (kartr) and enjoyer (bhoktr). In order for faith, knowledge and conduct to be "correct" (samyak), and thus ultimately conducive to the eradication of karma and suffering, their common source, the Self, has to be known. Hemacandra, therefore, prescribes how to acquire knowledge of the Self (atman). For this the passions (kasaya) have to be controlled and this is only possible if one controls the senses (indriya), for which mental purity (manahsuddhi) is required. The latter is obtained once attachment (raga) and aversion (dvesa) is eliminated through equanimity (samatva). Equanimity results from non-attachment (nirmamatva), which in turn results from contemplation (bhavana). Equanimity and meditation are mutually interdependent, and to even attempt to practice meditation without equanimity is, according to Hemacandra, nothing but mockery. After this description, Hemacandra urges the adept to cultivate benevolence (maitri ), appreciation (pramoda), compassion (karunya), and tolerance (madhyasthya), as a direct means of assisting with respect to the practise of meditation (dhyana). Meditation is twofold, virtuous (dharmya) and pure (sukla), and requires for its performance yogic postures (asana) depicted at the end of the fourth chapter. The following seven chapters may be viewed as an exegesis of the fourth chapter, particularly of meditation and its prerequisites, thus also covering the remaining limbs of the eightfold path. 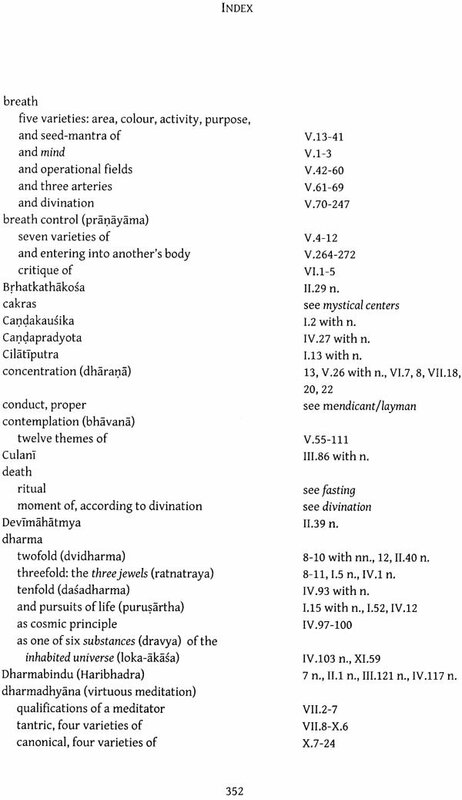 The fifth chapter describes various forms of breath control (pranayama), classic and Tantric. 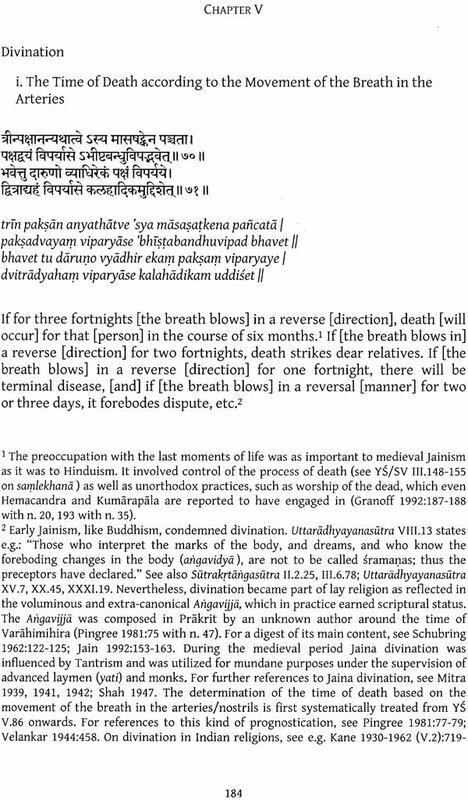 Breath control in itself leads to physical health (kayarogya) and ability to determine the time of death (kalajnana), but it may also be included as a complementary stereological tool conforming to the recommendations of Patanjali and others. The major part of the fifth chapter is devoted to various pan-Indian and Saiva, yogic and divinatory exercises, amalgamated with jaina doctrine and practice. 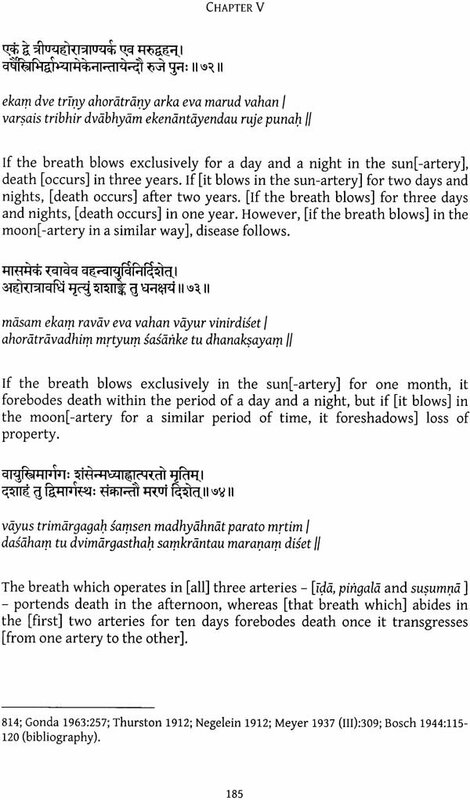 These are categorized under pranayama since they partly involve knowledge of the breath and its movement in the three arteries (nadi) and four operational fields (mandala). Hemacandra also records divination based on the knowledge of medicine (ayurveda), astrology (jyotisa), oneiromancy (svapnaSiistra), oracle voices (upasruti), animal portents (sakuna), interrogations (prasna), mental instalment of spells on the body (ariganyasa), mystical diagrams (yantra), etc. Most of these activities are related to the settlement of a person's longevity, but they also concern warfare, harvest and offspring, topics supposedly of concern to king Kumarapala as a private citizen and as the head of State. 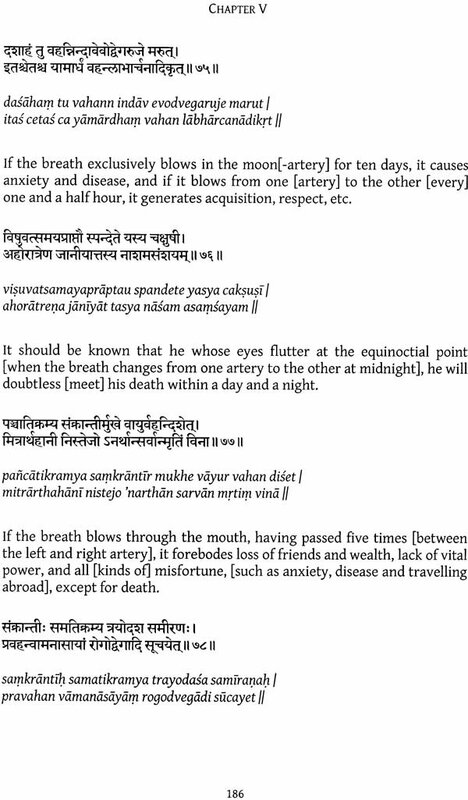 The chapterconcludes with a depiction of how to enter into another's body (parakayapravesa) . The sixth chapter contains a critique of the practice of breath control, which cultivated exclusively forms an impediment to the attainment of liberation, and a brief description of the practice of pratyahara, the withdrawal of the senses from their objects, and dharana or concentration. Analogous to pranayama, both of these are defined in accordance with the classical Yoga tradition and advocated as parts of the liberating path. Chapter seven opens with a depiction of the qualifications of a meditator (dhyatr) followed by a portrayal of the first of four kinds of meditation categorized as virtuous meditation (dharmadhyana). 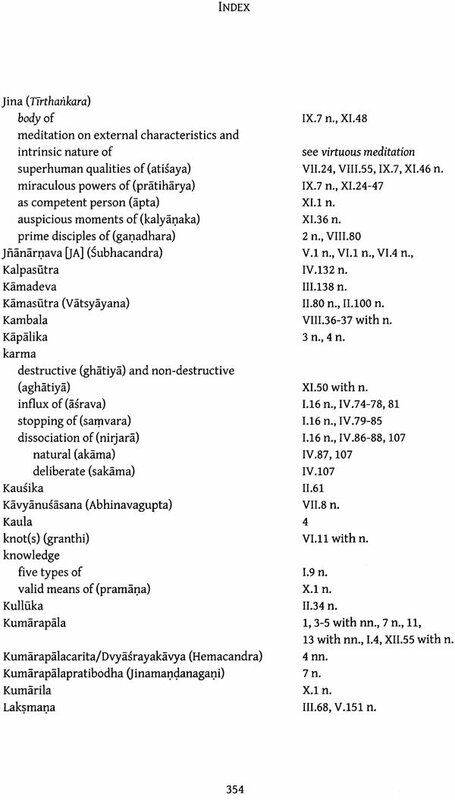 The other three varieties are outlined in chapter eight, nine and ten, respectively, and have as their objects holy syllables (pada), the external characteristics (rupa) and the intrinsic nature (rupatita) of the jina, in addition to imagined objects (pinda) distinctive of the first variety presented in chapter seven. 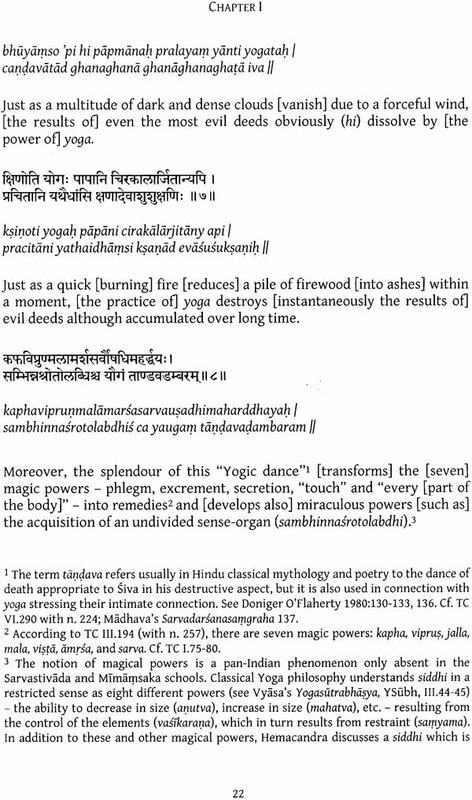 These four chapters thus express classical jaina teachings in a hitherto unknown terminology and compositional structure, probably stemming from "Kashmirian" Saivism, and also introduce new forms of meditation of Tantric provenance. The tenth chapter is also devoted to a description of the strictly canonical form of virtuous meditation (dharmadhyana) and its four types. 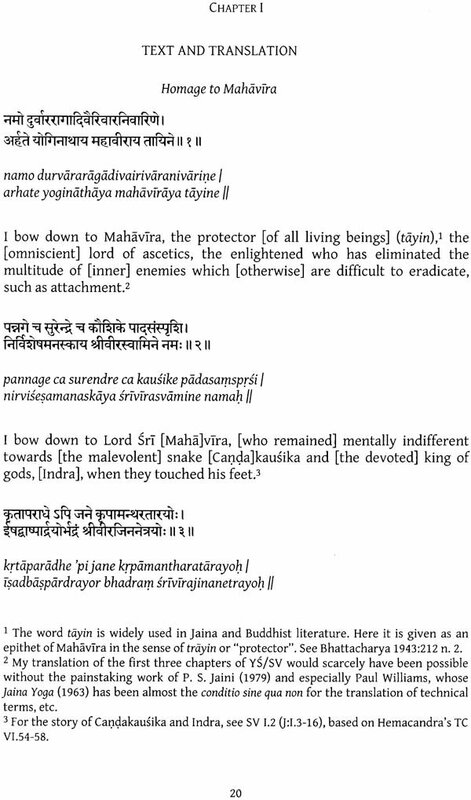 The succeeding eleventh chapter outlines the fourfold pure meditation (sukladhyana), its physical and psycho-physical preconditions, as well as the requirement of a jina being present and knowledge of the Parvascriptures acquired in order to perform this direct means to final liberation (nirvana). 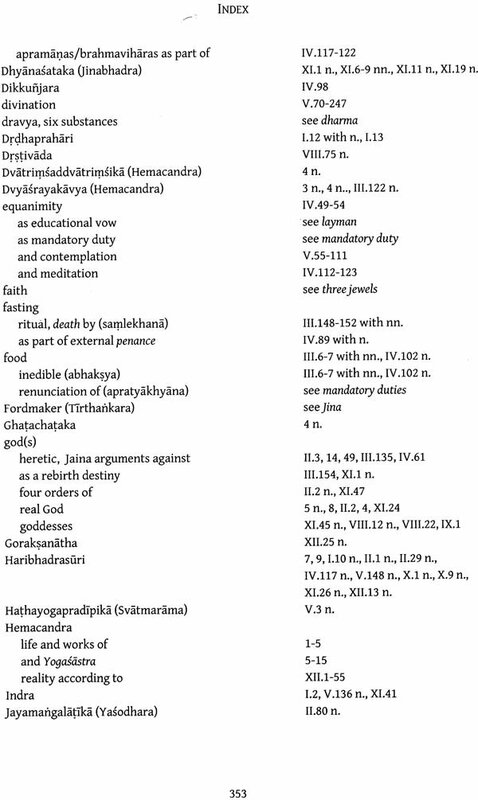 In the twelfth and last chapter, Hemacandra presents his own religious experience (svasamvedana) couched in a nomenclature unknown to the rest of the work. 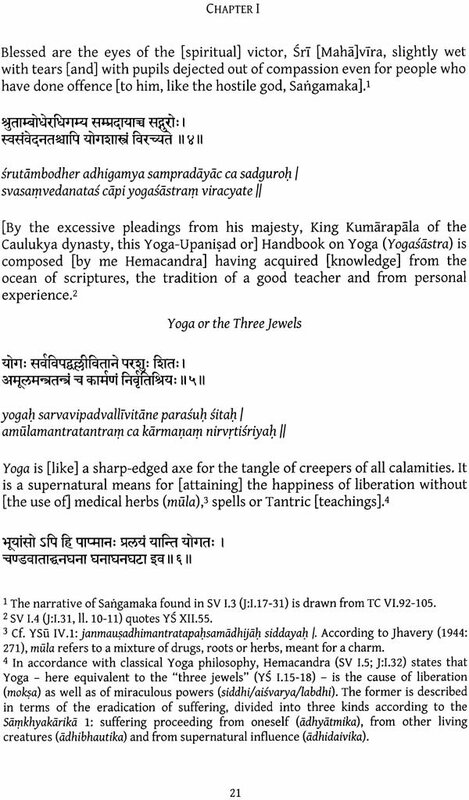 Hemacandra's highly formalized personal narrative gravitates around the practice of meditation as defined by the Uttaradhya- yanasutra and the Tattvarthasiitra in terms of the cessation [of the activity] of the mind (cittanirodha).1 It thus conforms with the earliest known definition of yoga found in the Kathopanisad and systematized in the classical Yoga tradition. The terminology, however, bears witness to the Nath Siddha tradition, with which the Svctambara jainas of Gujarat also shared various cult centres. Under the supervision of a teacher (guru), and through the cultivation of indifference (audasfnya) and practice (abhyasa), the mind reaches the state of no-mind and comes to rest as the Self is realized and Reality (tattva) uncovered. In the last verses of the twelfth chapter, forming the closing paragraphs of his Handbook on Jainism or Yoga Upanisad, Hemchandra sums up all the wisdom that he has acquired from the scriptures, his teacher and own personal experience by addressing the very self urging it not to seek happiness and success from outside, but instead to please itself realizing its inner glory and universal sovereignty.